Conventionally, the suspicion of gallbladder cancer (GBC) was considered a contraindication for laparoscopic surgery. With the recent success of minimal access surgery in colorectal malignancy, there has been recent enthusiasm toward laparoscopic radical cholecystectomy for GBC. However, there are published case series advising technical feasibility of the laparoscopic approach for radical resection of GBC; it appears that long-term oncological outcomes are still awaited., We recently encountered a case of carcinoma gallbladder operated with laparoscopic radical cholecystectomy that presented with early recurrence within 6 months of surgery. We hereby discuss the various factors that can be considered as a reason for failure of laparoscopic radical cholecystectomy. A 45-year-old man was diagnosed as a case of GBC on imaging for pain in the right hypochondrium. Contrast-enhanced computed tomography (CECT) scan showed a 2.8 cm × 1.8 cm enhancing irregular mass arising from the fundus and body with loss of fat planes with adjacent liver [Figure 1]a. He underwent laparoscopic radical cholecystectomy elsewhere. He was discharged on day 4 after an uneventful post-operative course. The final histopathology showed adenosquamous carcinoma infiltrating into serosa with focal infiltration into liver along with peri-neural infiltration and vascular embolisation. The resection margin and 0/2 lymph nodes isolated were free of tumour (pT3N0Mx, Stage IIa). Subsequently, he was given adjuvant chemotherapy (6 cycles of gemcitabine and carboplatin). After completion of chemotherapy, repeat CECT scan showed a 4.1 cm × 3.5 cm × 3.1 cm peripherally enhancing soft-tissue lesion in the right sub-hepatic region with indistinct fat plane with first part of duodenum and abutting hepatic flexure with no evidence of distant liver or peritoneal metastasis [Figure 1]b. Being a young patient with good performance status with no evidence of distant metastasis, he was planned for re-exploration 6 weeks after completion of chemotherapy. Per-operatively, a hard mass measuring 5 cm × 5 cm was present in the omentum in the sub-hepatic region infiltrating the antrum of the stomach and abutting the hepatic flexure of colon with transverse mesocolon and with dense peri-tumoural adhesions [Figure 2]. He underwent resection of mass with sleeve of stomach and segmental resection of colon with colocolic anastomosis and feeding jejunostomy along with re-resection of segment 4b and 5 of the liver and lymphadenectomy. His post-operative period was uneventful. The histopathology report revealed adenosquamous tumour infiltrating stomach and colon, while there was no residual tumour in the liver. Resection margin and 0/8 lymph nodes were free of tumour. Six months later, he developed liver metastasis along with recurrence at hilum. He died 7 months after the second surgery. With greater success of minimal access surgery in various gastrointestinal diseases, there have been quite a few reports and series on laparoscopic radical cholecystectomy in cases of GBC., To the best of our knowledge, this is the first report about early recurrence after laparoscopic resection for carcinoma gallbladder. 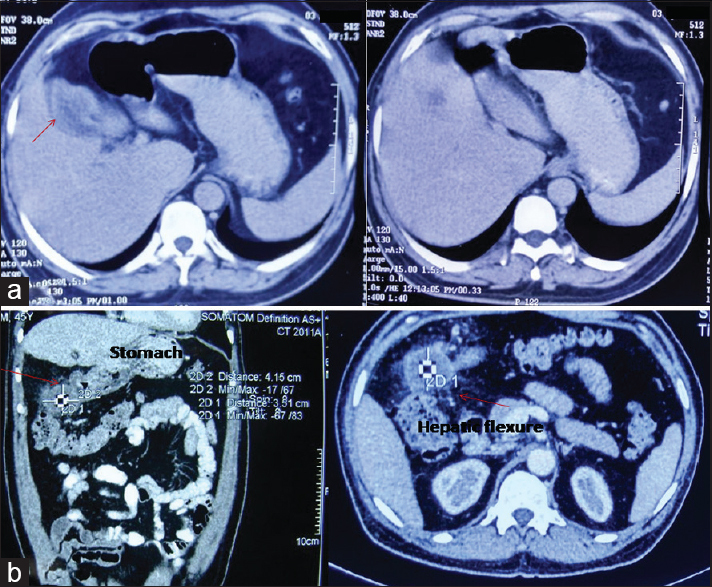 By analysing this case, we look at factors associated with laparoscopic surgery that could have contributed in early recurrence considering the aggressiveness and dismal prognosis of gallbladder carcinoma. The laparoscopic surgery in resectable GBC should be dealt with caution. Various factors that can be considered as a reason for failure of laparoscopic radical cholecystectomy are microperforation during handling, lack of tactile sensation during laparoscopic procedure, effect of high intra-abdominal pressure and pneumoperitoneum on tumour dissemination. Instrumentation during laparoscopic procedures causes multiple microperforations with tumour tissue exfoliation, leading to local as well as port-site recurrences. This seems to be most important factor for recurrence in our case since our patient had early recurrence away from tumour bed in the area of surgical dissection without any distant peritoneal spread and with a negative resection margin. The lack of tactile sensation during laparoscopic procedures is an important factor that could result in inadequate lymphadenectomy, especially early in the learning curve. In aggressive tumours such as carcinoma gallbladder where long-term prognosis is highly dependent on the adequacy of lymphadenectomy, this can also lead to early recurrences and distant metastasis. In our case, although lymph node yield was inadequate in the first surgery, it may not have contributed to recurrence in this case because lymph nodes removed during re-resection were free of tumour. There have been reports on the effect of CO2 pneumoperitoneum and high intra-abdominal pressures, leading to higher rates of tumour dissemination. Even historically, the incidence of port-site metastasis after laparoscopic cholecystectomy for incidental carcinoma gallbladder is very high as compared to incision-site metastasis after open cholecystectomy in similar cases. With recent studies on laparoscopic radical resection on GBC, it would not be justified to suggest that port site as relevant contraindication. This may be more relevant when inadequate resection, i.e., cholecystectomy, is done in patient with GBC wherein surgical planes are breached. The tumour-related factors which could have contributed to early recurrence are the presence of T3/4 tumour, lymph nodal spread, peri-neural invasion and peri-vascular embolisation. In our case, the tumour had peri-neural spread along with T3 disease. These factors may result in early recurrence; however, most such cases have a diffuse peritoneal spread or multiple liver metastasis. Isolated recurrence in the greater omentum along with involvement of stomach and colon away from tumour bed suggests tumour handling as an important factor contributing to early recurrence. The proposed advantages of performing radical cholecystectomy using laparoscopic technique are also arguable. There is minimal bowel handling during open surgery as well as laparoscopic surgery. In both situations, the patient can be allowed orally on post-operative day one itself. Hospital stay is not much different. The issue of higher pain scores in early post-operative period in open surgery as compared to laparoscopic surgery due to larger incision can be dealt adequately with analgesics. Hence, the only practical advantage that remains is cosmetic and some scar-related problems. Weighed against life-threatening recurrence risks, this advantage does not appear to be worth taking. In an aggressive tumour such as carcinoma gallbladder, one should be careful about the risk of dissemination, especially while handling the gallbladder during surgery, adequacy of lymphadenectomy performed and liver wedge removed and proposed advantage of the procedure at present. In case one is unable to fulfil the above criteria, the operation may be converted to open radical cholecystectomy to avoid poor outcome. Unfortunately, this procedure is also chosen to be performed in those cases who have the best chance of a cure by open surgery. We believe that surgeons performing this procedure should report the results to a central registry with open audits. Although this is just one case report, radical cholecystectomy in a case of carcinoma of gallbladder needs careful consideration. Palanisamy S, Patel N, Sabnis S, Palanisamy N, Vijay A, Palanivelu P, et al. Laparoscopic radical cholecystectomy for suspected early gall bladder carcinoma: Thinking beyond convention. Surg Endosc 2016;30:2442-8. Shirobe T, Maruyama S. Laparoscopic radical cholecystectomy with lymph node dissection for gallbladder carcinoma. Surg Endosc 2015;29:2244-50. Tran TB, Nissen NN. Surgery for gallbladder cancer in the US: A need for greater lymph node clearance. J Gastrointest Oncol 2015;6:452-8. Paolucci V. Port site recurrences after laparoscopic cholecystectomy. J Hepatobiliary Pancreat Surg 2001;8:535-43.